About a month ago All About Symbian‘s Rafe Blandford published an extensive set of browser speed test results. 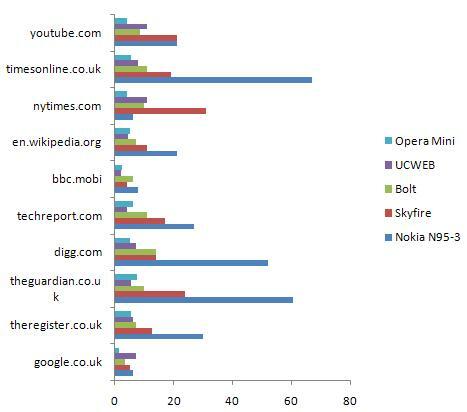 Rafe compared page load times for ten well known US and UK sites using eght different Nokia S30 3rd and 5th editon devices plus the T-Mobile G1, iPhone 3G, Skyfire and Opera Mini. Latter Matthew Miller at Smartphones and Cellphones updated Rafe’s data with numbers for the iPhone 3GS and Opera Mobile 9.7. Rafe and Matthew’s data showed that smartphone browsers are getting faster and faster. The N86, N97, 5800 and iPhone 3G were all about twice as fast as the N95. The iPhone 3GS lived up to Apple’s claims being about twice as fast as the iPhone 3G and latest Nokia browsers. But the real speed champs were Opera Mobile and Opera Mini which were both about 30% faster than even the iPhone 3 GS. Opera Mini is a server assisted browser. Pages are rendered on an Opera Server and them compressing into a compact binary format that downloads quickly and can be decompressed and displayed using relatively little CPU and RAM on the phone. Opera Mobile 9.7 has an optional Opera Turbo mode which works like Opera Mini and was used by Mathew Miller in his speed tests. This got me to wondering about the performance of other server assisted browsers like Bolt, UCWEB and Skyfire. I repeated Rafe’s tests on those three browsers plus Opera Mini and the native Nokia browser on my N95-3. Rafe also tested the Nokia browser, Opera Mini and Skyfire. Including those browsers in my tests gives a good baseline for direct comparison with Rafe and Mathew’s results. I follwed Rafe’s methodology as closely as possibe, I used WiFi and repeated each test five times, discarding the best and worst results and averaging the three remaining. There were differences of course, for one thing my ADSL line is only 1.5 Mbps compared to Rafe’s 8 Mbps line, but my numbers for the Nokia and Opera Mini browsers were very similar to Rafe’s. However I got considerably slower performance from Skyfire. I’m not sure why, perhaps the lower DSL speed contributed along with the fact that Rafe ran Skyfire on an N86 rather than the older N95. It’s also possible Skyfire’s UK servers are faster than the US ones. Also I tested the time for each browser to display a fully zoomed page. Zooming in on all the browsers is instantaneous except for Skyfire where it adds between one and eight seconds to the total time. I don’t know whether Rafe’s numbers include the time require to zoom in but I felt that it was important to do so as zooming in is necessary to get readable text on most pages. My results confirm that Opera Mini is currently the fastest mobile browser by a small margin, follwed by UCWEB, Bolt and Skyfire. All four server based browsers were much faster than the Nokia browser. The Nokia browser’s numbers would have been even worse except for the fact that the site refused to deliver its full web version to the Nokia browser always redirecting to the much smaller mobile web page. On course speed isn’t everything. For online banking and financial transactions having all your browsing traffic pass through a third party server has potential security implications. Direct browsers like the Nokia , iPhone and Android browsers and Opera Mobile with Opera Turbo turned off are theoretically more secure. Speed is only one part of a browser’s feature set. Of the five browsers, Opera Mini is the relatively feature poor, lacking tabbed browsing which UCWEB and the Nokia browser support or the ability to copy text from web pages found in UCWEB and Bolt. Skyfire is the only mobile browser that supports Flash 10 and Silverlight making it the best choice for watching online video on a mobile phone. Personally I have all of these browsers installed on my N95 and use whichever one is most appropriate to the job at hand. This entry was posted in Browsers and tagged Bolt, iPhone 3G, mobile browser speed test, Opera Mini, Opera Mobile, Opera Turbo, server assisted browsing, Skyfire, Symbian, UC Browser by Dennis Bournique. Bookmark the permalink. Which browser is good for Nokia 5800 XM mobile also which browser is good to see youtube videos on Nokia 5800 XM? Provided you have a good Edge connection, mobile formatted streaming videos from http://m.youtube.com and most of the sites listed at http://wapreview.com/?id=2618 should work on your phone. You won’t be able to download a Flash Player though as none exists for java ME. great work.I feel ucweb is really very slow as compared to opera mini though it has very good options. Is it problem of browser or my gprs speed? Ahich one wil u prefer opera or ucweb? I mainly use Opera Mini, however I don’t find UCWEB noticeably slower. The difference might be related to the performance of the network connection between your network operator and the UCWEB proxy server vs. the Opera one. If that’s the case there’s not much you can do about it. i have a problem bout my nokia phone how to activate the opera mini setting ? can any body help me? wow,the leatest version of UCWEB is 7.0beta2. you may have some fun. I was wondering how to you time your loading? Carl, “Back” almost always reloads the page in the Nokia browser. It’s a bug that’s been around for years. I recommend you try Opera Mini or UCWEB which are both better browsers and have a working back button. Can anyone test the dolphin Browser of Samsung? I have browser question that I hope you can help me with! It is possible to “go back” to the previous viewed web page without reloading it with the Nokia browser? Thanks. although I can install unsigned apps, I don’t usually cover them. Not many people seem willing to get the certs and sign apps themselves or hack their phones. Do the unofficial translations still send Chinese accept-language headers or has that bug been fixed? I think a lot of the test sites would show their Chinese versions unless it has – which wouldn’t make a very good test.